WEST LAFAYETTE, Ind. 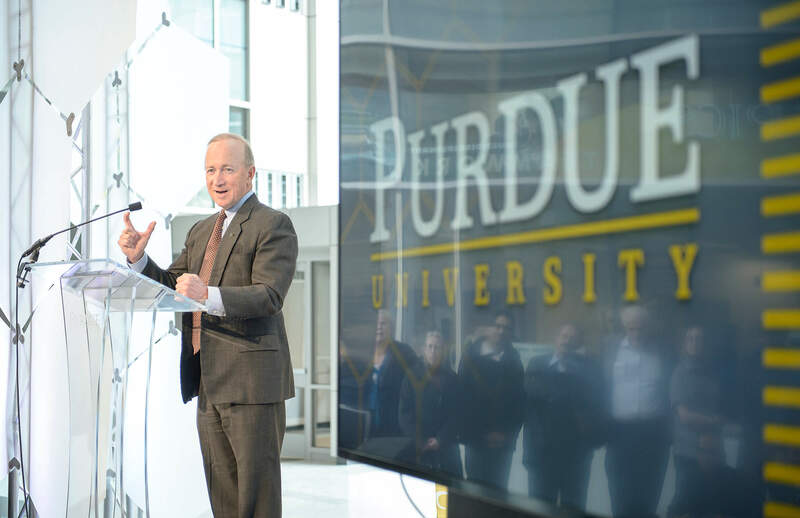 - The biggest cash donation in Purdue University’s history will fund initiatives designed to foster groundbreaking research, expand high-tech job growth throughout Indiana as well as nationally and globally, and enhance opportunities for students. 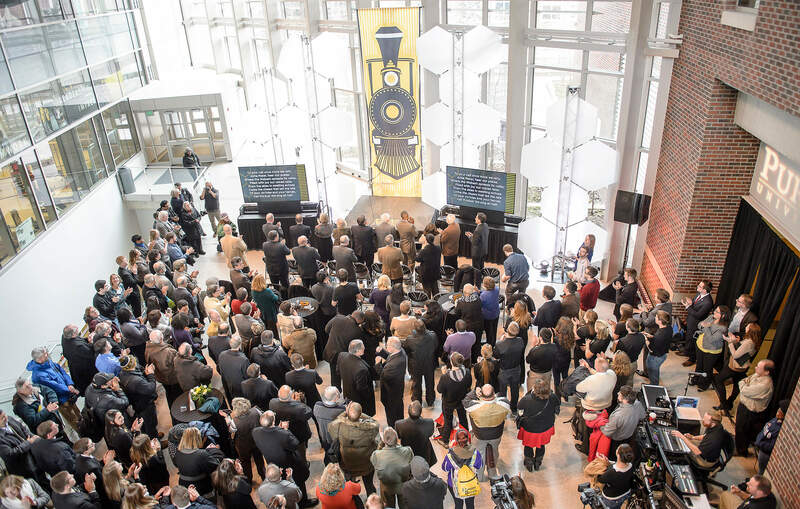 Lilly Endowment Inc. announced Wednesday (Feb. 18) a $40 million grant to support five transformational projects in the colleges of Engineering and Technology as well as Purdue Libraries. * $13 million for the Innovation Design Center, a project envisioned by and for students. The center – accessible 24 hours a day and seven days a week - will provide engineering and technology students with open-bay space, collaborative areas and computer-aided design studios in which they can develop, build and test extracurricular and course-based design projects. Students will enter the workforce with an enhanced skill set developed from the learning and hands-on activities. * $5 million for expansion of the College of Engineering’s Maurice J. Zucrow Labs, the nation’s largest university propulsion laboratory, which uniquely can study a single combustion site in the largest of liquid rocket or gas turbine engines at full-scale temperature, pressure and flow conditions. Originally developed in 1964 as part of the Apollo space program, the labs will be expanded to include five new test cells and a laser diagnostics lab for environmental controls. This expansion will significantly increase research collaborations with the world’s leading gas turbine firms as well as expand entrepreneurial opportunities. * $13.5 million for a $54 million Flex Lab in the College of Engineering that will enable faculty teams to collaborate on research that ranges from advanced manufacturing to imaging, and from information technology to medical devices. The planned 75,000-square-foot Flex Lab is critical to the strategic growth in engineering and will boost industry- and government-funded research collaborations and intellectual property development. In 2014 the College of Engineering received 106 U.S. and international-issued patents and generated 16 startup companies, 15 of which are located in Indiana. This lab expansion will spark a 30 percent increase. Designed to adapt to the creative and innovative needs of professors and their students, Flex Lab will house wet-lab, dry-lab and open collaboration spaces that support many disciplines. * $5 million for the Active Learning Center, a facility that will fuse classrooms, libraries, and study and collaboration areas into one adaptable space — an innovation that no other American university offers. The active-learning approach encourages students to be more active and engaged in their learning activities and the knowledge gained. Early indications of this new approach are profound: higher student GPAs and decreased number of students who earn a grade of D or F or withdraw from these courses. The facility will consist of 38,000 square feet of study space and 59,000 square feet of classroom space. * $3.5 million for the College of Technology’s transformation into the Polytechnic Institute, which will introduce student-driven, project-based courses designed to address the expressed needs of the Indiana industries that employ so many of Purdue’s technology graduates. The college’s goal will be to create a student-centered curriculum that features a range of experiential and competency-based degree programs to provide students with deep technical skills grounded with a foundation in the humanities, innovation and entrepreneurship. With Purdue’s plan to strategically grow the number of students and faculty in the College of Engineering, Purdue will contribute one out of 20 of the new engineers in response to the national call to graduate 10,000 more engineers per year, Jamieson said. David Joyce, president and CEO of GE Aviation, applauded the Lilly Endowment investment as a step toward providing more of the engineering and technology graduates who will be needed for the future of manufacturing, along with increasing research that moves industry forward. GE formed a partnership with Purdue last year to provide research and development in advanced manufacturing, and is building an advanced engine assembly site in Lafayette. “GE is proud to be the largest corporate employer of Purdue graduates in the world. We value the skills and experiences they bring to our businesses, and are happy that the Lilly Endowment grant will be used to further their studies and provide opportunities for even more students in the College of Engineering and College of Technology,” he said. Through the Innovation Design Center, the grant will provide opportunities for the colleges of Engineering and Technology to work together, the deans said. “Having our technology and engineering students work together is one more step in producing graduates who are prepared to make a difference on a broader scale,” Bertoline said. 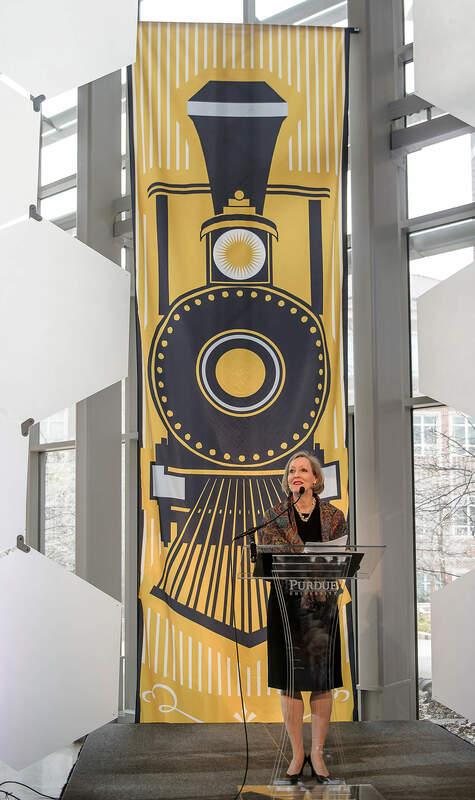 Lilly Endowment has supported other research and technology efforts at Purdue University, including a nearly $26 million grant in 2001 that launched Discovery Park, Purdue’s complex for advanced interdisciplinary research and education. In 2005 the Endowment gave an additional $25 million for continued development of Discovery Park. The Active Learning Center, under construction in the heart of campus at the former site of the Engineering Administration Building and the North Power Plant, will blend and integrate centrally scheduled active-learning classrooms, library/information services, formal study spaces, collaborative work areas and informal learning spaces. During the class day, 40 percent of the center will be library/study spaces. During the evening and throughout the night, the study space will expand to nearly the entire building. Inside the center, six libraries currently located at various points on campus will come together to form the Thomas S. and Harvey D. Wilmeth Library of Engineering and Science. Students will be able to tailor spaces to their own needs, pursuing information on their own or meeting in discussion and study groups. “The Active Learning Center will enable the growth of an innovative and successful teaching/learning methodology, that is, the individual learning by and through team collaboration in a facility that supports learning taking place seamlessly between the classroom and library spaces,” Purdue Libraries Dean James L. Mullins said. The Innovation Design Center, Zucrow Labs expansion, Flex Lab and Active Learning Center are all scheduled to be ready for use in 2017. Note to Journalists: Video b-roll will be made available for download after the event at ftp://news69.uns.purdue.edu/Public/EndowmentGrant/.